Photo submitted Pictured are winners of the Mercy-Health St. Rita's scholarship.In front, from left, are Jessica LaFontaine, Ashley Bowen, Kateland Keene and Jordan Hinegardner-Hendricks. In back are Erryk Katayama, Zachary Ziccardi, Jacob Kahle, Dominic Schroeder and Molly Fischbach. Each of the winners received $1,500 to support their future in the medical field. “One of the main goals of the program is to build a connection between the students and St. Rita’s, so that students are inclined to return to the region in the future, to complete their training or practice their skills, said Dale Gisi, president of Mercy Health-St. Rita’s. “Our goal is to help you along your path, and one day welcome you back to extend our care into the communities we serve throughout West Central Ohio,” Gisi told the students. • Ashley Bowen, Crestview, plans to attend Write State University-Lake Campus to major in nursing. • Molly Fischbach, Shawnee, plans to attend Ohio State University for nursing. • Jordan Hinegardner-Hendricks, Lima Central Catholic, plans to attend Miami University for pre-med. • Jacob Kahle, Kalida, plans to attend The University of Toledo for biology/pre-med. • Erryk Katayama, Ada, plans to attend Case Western Reserve University for biochemistry/pre-med. • Kateland Keene, St. Marys, plans to attend John Hopkins University for biology/pre-med and anthropology. • Jessica LaFontaine, Liberty-Benton, plans to attend The University of Findlay for nursing. • Matthew Miller, Delphos St. John’s, plans to attend Ohio State University for biology. • Dominic Schroeder, Miller City, plans to attend Youngstown State/NEOMED for biology/med. • Zachary Ziccardi, Shawnee, plans to attend Case Western Reserve University for neuroscience/biology. 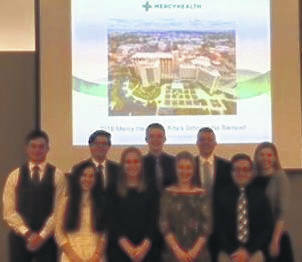 https://www.limaohio.com/wp-content/uploads/sites/54/2018/05/web1_Mercy-Health-Scholarship-winners.jpgPhoto submitted Pictured are winners of the Mercy-Health St. Rita's scholarship.In front, from left, are Jessica LaFontaine, Ashley Bowen, Kateland Keene and Jordan Hinegardner-Hendricks. In back are Erryk Katayama, Zachary Ziccardi, Jacob Kahle, Dominic Schroeder and Molly Fischbach.